IDE (Integrated Drive Electronics) or better known as PATA (Parallel ATA) is very common interface in today PC architecture. Most of the chipset will probably have this interface for external hard disk storage or optical drive connection. In order to support the ease of use, there is already some external adapter to convert from IDE to USB 2.0 aiming for USB devices such as portable hard disk. However, IDE to SD/MMC slot adapter could be something new and even useful in view of popularity of external memory cards usage in current mobile market. 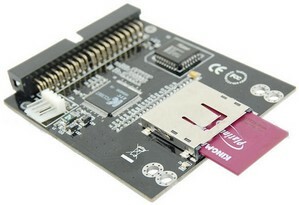 With this kind of adapter in place, there is a way to connect the SD/MMC memory card to IDE host interface directly. Typically, some newer version chipsets do offer SDIO (Secure Digital Input Output) port for on board memory card slot expansion. But for older PC architecture that doesn’t come with SDIO interface, this could be an alternative and quick solution for platform development. Furthermore, it doesn’t require any additional driver for proper operation since the host system will recognize it as one of the IDE drives. Current trend is moving towards SATA (Serial ATA) or even eSATA with higher bandwidth. I wonder if there will be a plan to release of SATA/eSATA to SD/MMC converter soon. Anyway, at an affordable price of $24.99, it is a good deal to get an additional interface on your old PC.